Transfection is a laboratory research method for studying gene function. Transfection is a non-viral gene transfer technique used in life science and pharmaceutical research. It is contrasted with transduction, which involves the use of viral vectors for gene transfer. Transfection can result in the transient (temporary) or stable (permanent) introduction of exogenous molecules and genetic material, such as DNA (shown right) or RNA, into cultured mammalian cells. The technique is commonly utilized in biological laboratories for studying gene functions, modulation of gene expression, biochemical mapping, mutational analysis, and protein production. Researchers use various carrier molecules to enable non-viral gene delivery of plasmid DNA (pDNA), messenger RNA (mRNA), short interfering RNA (siRNA), and microRNA (to induce RNAi) into cancer cell lines and primary cells. Unfortunately, no single delivery method or transfection reagent can be applied to all types of cells; cellular cytotoxicity and transfection efficiencies vary dramatically depending on the reagent, protocol and cell type being utilized (there are over 80 commercially available cell line specific kits with optimized transfection protocols, see this list). There are three modes of genetic transfer in bacterial cells: transformation (cellular uptake and incorporation of exogenous DNA), transduction (transfer of genetic material from one bacterium to another through bacteriophage), and conjugation (genetic material transfer between bacterial cells by direct cell-to-cell contact). Transfection is a deliberate process that involves the opening of transient pores in eukaryotic cells to allow the uptake of exogenous molecules and genetic material. Lipids can be an important factor in this process: a type of a lipid-mediated transfection process, called lipofection (liposome transfection), has already improve the efficiency of transfection techniques. Lipofection is a lipid-mediated DNA-transfection procedure that makes use of liposomes. Due to a multitude of factors (including the size and charge of DNA along with the multitude of enzymatic and membrane barriers), the spontaneous introduction of genetic material into a cell and the expression of genetic material in the nucleus is a very inefficient process. The lipofection method is effective due to the fact that it allows the genetic material to be transfected in liposomes; which are able to fuse with the cell membrane because of its nature as a phospholipid bilayer (lipids are able to conjoin with the cell membrane). If transient (temporary) expression of transfected materials is desired, DNA is transfected into the targeted cell, where it remains in the cytoplasm. On the other hand, DNA can be used for the stable expression of genes, requiring transport into a target cell’s nucleus. Once in the nucleus, the DNA can be incorporated into the genomic DNA and be passed on from cell to cell as it undergoes mitosis or meiosis. Cell transfection by calcium phosphate was one of the earliest chemical-based methods developed to deliver exogenous nucleic acids to cultured mammalian cells. This method is dependent upon the use of a calcium chloride-containing HEPES-buffered saline solution to deliver plasmid DNA. Advances in the development of lipid and polymer-based carrier molecules capable of binding nucleic acids led to the adaptation of these compounds for transfection. Many of these compounds create liposomes, which can fuse with the cellular membrane in order to deliver the bound RNA or DNA to the cell. This is an effective process to overcome cells’ natural resistance to the insertion of genes and maintaining the safety of the organisms being used. During this process the introduced nucleic acid may be transient (does not replicate) or it may be stable and fused into the genome of the recipient, therefore replicating when the host genome replicates. This is an important differentiation to understand when dealing with transfection, because the end result is varying and needs to be decided on depending on the goal of a particular transfection experiment. The terms “transfection” and “transformation” have had varied meanings over time in the field of biomedical study. In more recent years, the term transfection has developed to include any artificial introduction of foreign nucleic acid into a cell. While effective delivery of genetic material (DNA and RNA) is still a challenge, recent advances in delivery technologies have allowed for the development of a new generation of transfection reagents both for in vitro and in vivo applications. These methods are a powerful tool in basic life sciences research and associated clinical studies. The introduction of DNA and RNA molecules into cultured mammalian cells requires the use of various transfection methods that depend, in part, on the cell lines being utilized and the types of experiments being performed. For maximum efficiency, these different methods are used in accordance with cell type and purpose. Depending on these factors, specific methods are selected to achieve minimum cell toxicity and have as minimal an effect on normal physiology as possible. Typically, these methods are categorized as viral, non-viral, chemical-based, non-chemical, and particle-based, with less common methods being gene guns and hybrid types. Making the right selection in method is vital due to the difference in their procedures. Whether you intend the process to produce DNA-carrier lipid complexes, or use packaging of viral based plasmids with specific individual properties, each varies in the way DNA or RNA is delivered. Furthermore, each method differs in efficiency and estimated longevity of experimental data gathering. The most standard methods, discussed in more detail below, include chemical (liposome-mediated, non-liposomal lipids, polyamines, polymers), physical (electroporation, microinjection, heat shock), or viral-based (retrovirus, adeno-associated virus, lentivirus) delivery systems. Liposomes are synthetic analogues of the phospholipid bilayer of the cellular membrane. These compounds contain a number of the physical characteristics of phospholipids including the presence of hydrophobic and hydrophilic regions of each molecule, which allows for the formation of spheroid liposomes under aqueous conditions. In the presence of DNA or RNA, liposomes are capable of interacting with and encapsulating the nucleic acids, thereby creating an efficient delivery system. The liposomal charge, composition, and structure defines the affinity of the complex for the cellular membrane. Under specific conditions, the liposome complex is able to interact with the cell membrane, which enables its uptake by endocytosis and subsequent release into the cellular cytoplasm. The successful use of liposome compounds to deliver exogenous nucleic acids to specific biological system is dependent upon lipid formulation, charge ratio, particle size, and the method of liposome preparation. Several non-liposomal lipids and some polymers have been developed that are capable of forming complexes with DNA or RNA and have the potential to form micelles. The transfection reaction is usually performed under aqueous conditions which enables the lipophilic portion of the amphiphilic compound to form the micelle core within which the exogenous nucleic acids are located. Superior transfection efficiencies can be achieved in cell lines that are responsive to liposome-based transfection. Dendrimers are highly branched, globular macromolecules that are capable of interacting with and condensing DNA in small complexes. However, dendrimers are non-biodegradable and even at relatively low concentrations may cause significant cellular toxicity, thereby inadvertently affecting the outcome of the experiment. Polyamidoamine dendrimers are non-linear polycations and cascade polymers that can bind to plasmid DNA. Dendrimers are synthesized through the repeated addition reaction of methyl acrylate and the reaction of the product with ethylenamine, resulting in spherical molecules of defined size that have alternating bonds of amide and amine in the form of layers of shells. These shells which are known as generations are built up one after the other and after four generations the steric factors cause the dendrimer to become spherical. The net charge on these dendrimers is positive. Positively charged amino groups on the surface of dendrimer molecule interact with the negatively charged phosphate groups of the DNA molecule to form a DNA-dendrimer complex. This complex has an overall net positive charge and is capable to bind to negatively charged surface molecules on the membrane of eukaryotic cells, followed by cell uptake via non-specific endocytosis. Electroporation is a highly efficient technique, and often the only option, for delivering exogenous nucleic acids to cells grown in suspension and certain primary cells. The cell membrane is composed of lipid bilayers and when they are subjected to an electric field, a short term depolarization occurs which results in structural changes and formation of transient pores, known as electropores, which enables the delivery of charged molecules like RNA or DNA to the cytoplasm and nuclei of the targeted cells. Two types of electrical pulses have been used efficiently for cell electroporation: exponential decay and square wave. Other types may exist, but the two main ones have been extensively tested for efficiency. Direct injection of DNA into the nucleus of the cells or RNA into the cytoplasm of the target cells. This process involves the use of very thin glass capillaries which can inject nanoliters of nucleic acid solutions into the cells. Microinjection methods are utilized in cases where individual cell manipulation is possible, such as the genetic engineering of embryo cells. Certain cell types and/or experimental conditions require that specific cells within a population are targeted for gene delivery. In these instances, gene guns or manual microinjection are very efficient techniques for the direct delivery of DNA to specified target cells. However, the method is limited with regard to the number of cells to which the exogenous nucleic acids can effectively be delivered and requires certain operator skills. Delivery of nucleic acids into the cells by using high-velocity nucleic acid coated particles. This method can utilize a gun system or biolistic particle delivery system (BPDS). While the gun is more portable and involves less pressure (100-600 psi), the BPDS system has more surface area application and uses higher pressures (up to 4000 psi). Both methods use a relatively small amount of DNA, thus avoiding the waste of genetic material. DNA can be introduced into cultured mammalian cells by viral transduction techniques using viruses as carriers. Viral delivery is beneficial for transfection of primary cell cultures and numerous studies have developed in vivo gene delivery approaches, however the clinical and laboratory uses of these techniques also carry significant bio-hazardous risks. Transfected genetic material can be expressed in the target cells either transiently or permanently depending on the methods utilized and the experimental questions being investigated. Transient transfections are used most commonly to analyze the short-term impacts of altered gene or protein expression. Plasmid DNA, mRNA), si/shRNA, and microRNA, are introduced and gene products are expressed in the target cells. However, the nucleic acids do not integrate into the host cell genome. Gene product expression is transient and typically results in high expression levels that persist for 24-72 hours when RNA is transfected, or 48-96 hours following DNA transfection. Conversely, in order to analyze the long-term impacts of altered gene or protein expression, investigators typically utilize stable transfection protocols to develop stable cell lines. In a subpopulation of transfected cells, whether the desired effect is a stable or transient transfection, the transfected genetic material will integrate into the genome. In order to create stable cell lines, investigators will take advantage of this natural occurrence, and introduce the gene of interest along with a selectable marker. Growth of transfected cells, in the presence of a selecting agent, will enable the subpopulation of cell where the exogenous genetic material has been incorporated into the genome to persist while the remaining cells undergo selection. Utilizing this method, investigators are able to develop cells that permanently express specific genes through their incorporation in the cellular genome. Altogen Labs offers development of stable cell lines service by transforming your cell line to stably express vector or gene of interest. Primary cell cultures are used in biological and gene therapy studies and serve as important model systems that may more accurately represent the biology of normal cells. Many cultured cell lines, as well as the majority of primary cell cultures, are able to be transfected with exogenous nucleic acids when appropriate transfection approaches are employed. Since the majority of transfection methods causes significant toxicity in primary cell cultures, optimizing this procedure, specifically the protocol and reagents to be utilized, is essential for developing effective transfection strategies for a given cell type. Altogen Biosystems developed AltoFect™ Transfection Reagent – a new generation transfection reagent optimized for high transfection efficiency of primary cells and difficult-to-transfect cell lines. It has been successfully tested to deliver all types of nucleic acids into large number of primary cell types and hard-to-transfect cell lines including primary neuronal cells and suspension cell cultures. Cancer cell lines are used for reproducible data from one lab to another and are imperative for the development of data and medicines. Cancer-derived cell lines are used to study the biology of cancer, but they also provide a valuable environment for researching drug efficiencies and testing transfection-based therapies. Cancer cell lines also have, in relation to primary cell lines, avoided the usual cellular senescence and are therefore helpful to preclinical trials because of their proliferative abilities; these cells, due to their immortality, can be grown continuously in culture. This allows for a multitude of tests and transfections to be run on them, giving substantial amounts of high quality data. RNA interference (RNAi) is a phenomenon by which the expression of double stranded RNA (dsRNA) specifically stimulates a cellular process that reduces gene expression in a sequence-specific manner. Small synthetic RNA, termed small interfering RNAs (siRNA), which are typically 21-28 nucleotides in length, can induce RNAi and knockdown of targeted gene expression in mammalian cells without inducing an antiviral response. Biochemical studies have elucidated the mechanism of RNAi. Double stranded RNA is processed by an enzyme known as Dicer resulting in the production of siRNA molecules. 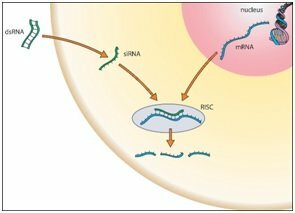 These molecules are then able to form a multi-protein siRNA complex, known as the RNA-induced Silencing Complex (RISC). The RISC/siRNA complex catalyzes the cleavage and degradation of the complement mRNA molecules. The use of RNAi applications, including siRNA and siRNA library screening (when a set of siRNAs are used that target each individual gene in a human genome), to inhibit cellular gene expression appears to have significant advantages over other approaches for targeted gene regulation and has led to the development of novel gene-targeted RNAi therapeutics. The potency of siRNA molecules, sequence-specific design, and ability of siRNAs to be re-used to guide mRNA degradation in cells bears a significant advantage over anti-sense oligonucleotides and ribozyme-stem approaches. Liposome encapsulated and functional siRNAs are capable of effectively bypassing the interferon response in order to induce post-transcriptional gene silencing in vitro, as well as inducing RNAi in vivo. Gene silencing by RNA Interference (RNAi) is a powerful research tool for studying gene function in mammalian cells. RNAi silencing is a biological phenomenon by which double stranded RNA (dsRNA) specifically reduces the expression of its corresponding gene. Potent inhibition of specific gene expression is experimentally achieved by the transfection of small interfering RNA (siRNA), which binds RISC complex and causes degradation of target complementary mRNA molecules in the cell. Successful, potent RNAi experimentation is dependent upon the highly efficient delivery of the siRNA into cells by transfection of stable and functional siRNA molecules. Gene silencing or knockdown is done easily in most cell types, but the siRNA needs to be designed against the relevant gene and keep cell viability as a vital factor. siRNA transfection is referred to as “transference” and utilizes experimentation both in vivo and in vitro. Reverse transfection is another option in less common experimental situations, offering comparatively stronger benefits. Determining ratios between siRNA oligos as well as siRNA concentration is essential to maximum efficiency, and is typically regulated in accordance to relevant siRNA protocols. Most DNA transfection reagents are incompatible with siRNA, sensitive to serum, or are capable of inducing cytotoxicity, which negatively affects gene expression studies. siRNAs can be associated with off-target activity and complicate the interpretation of experiments, which is why it is important to prioritize working with specially engineered equipment and protocols. Altogen transfection kits have been developed for use with both DNA and siRNA transfection, optimized for specific cell type in vitro or targeted to a certain tissue in vivo, and are fully compatible with serum without lowering transfection efficiency or reducing cell viability. Ready-to-run transfection protocols eliminate the need for extensive siRNA optimization experiments. Altogen Biosystems kits are also compatible for transfection of other types of small RNA, including miRNA (microRNA) molecules, Piwi-interacting RNAs (piRNAs), rasiRNA, etc. RNAi can be used as a research tool to study the function of single or many thousands of genes in cells. siRNA libraries composed of large numbers of siRNAs have been developed and are used to identify sets of genes functionally involved in a particular biological process or disease metabolism. Phenotypic high throughput siRNA screens are a powerful approach to study structure/function relationships of genes and to identify novels parts of signaling pathways. In fact, large-scale siRNA screening is now commonly used for functional genomics and drug target validation. High throughput applications require that reliable and reproducible transfections can be performed in a 96-, 384-, or 1536-well plate format. Several transfection reagents are compatible for high throughput siRNA transfection, as well as other types of small RNA, such as microRNA, piRNA, and rasiRNA. A technique known as reverse transfection has been developed which allows for the plating of the cells and delivery of siRNA-reagent complexes on the same day, thereby eliminating a source of variability in cell culture and improving transfection efficiency. A number of studies have demonstrated the successful application of RNAi in primary cell cultures and non-neuronal cell lines. However, the use of gene silencing in neuronal cell types has been notoriously difficult because of several technical and biological limitations. Neurons have been considered the most resistant to RNAi. Methods to consider when performing nucleic acid delivery experiments with neuronal cultures include electroporation, microinjection, viral-based methods, and certain chemical transfection reagents. Although physical transfection methods appear to be efficient for siRNA-induced studies where transient modification of gene expression is sufficient, these methods do not appear to be adequate for behavioral studies where long term alteration of gene expression may be necessary. The viral-based siRNA expression systems appear to be most applicable for both Central Nervous System (CNS) gene therapy and basic neurobiological studies, while adeno-associated virus (AAV) delivery systems enable long-term stable gene expression with relatively little cytotoxicity. Lentiviral vectors have been reportedly used successfully for the delivery of short hairpin RNA (shRNA), a precursor of siRNA, into primary neurons to induce RNAi. The advantage of lentiviral system is the ability to transfect non-dividing cells. Altogen Biosystems manufactures several transfection reagents optimized for neuronal cells transfection, including Astrocyte, CLBPEC (neuroblastoma), DI-TNC1, Neuro-2a, PC-12, and AltoFect™ Reagent. The capability of siRNAs to mediate post-transcriptional gene silencing in mammalian cells and tissues, as well as its successful use to prevent expression of target mRNA, has recently led to the development of a new methodology for novel drug discovery. Several pharmaceutical and biotechnology companies are currently investigating the possible use of synthetic siRNA for inducing RNAi in vivo, its use in animal models, and in RNAi-based therapeutics. Small RNA molecules, such as siRNA and miRNA, have been regarded as potential therapeutic agents to target multiple regulated cellular processes, and it is theoretically possible that RNAi can be utilized to treat any disease associated with over expression of specific genes (e.g. oncogenes). In fact, there are many reports that address the potential therapeutic application of RNAi to specifically target genes involved in multiple diseases including various forms of cancer, Alzheimer’s, and a number of inflammatory and virally-associated diseases. However, a number of major difficulties associated with inefficient delivery of functional RNA molecules into cells and the reduced biostability of unmodified RNA must be overcome. Efficient and organ-specific delivery of synthetic oligonucleotide molecules is currently a key limiting step to enable siRNA- and microRNA-based therapeutic approaches. In the last 9 years, Altogen Biosystems has focused on the development of efficient in vivo RNAi reagents and RNAi delivery technologies. RNAi has been used for in vivo target validation studies using animal models. The major challenge in performing RNAi studies in vivo is the effective, directed delivery of functional small RNA molecules into specific tissues. Altogen® in vivo transfection reagents can be conjugated with siRNA and administered intratumorally (i.t) or systemically via intravenous (i.v) tail vein injection in order to provide directed gene silencing in specific tissues, including liver, pancreas, kidney, and tumors. Selective knockdown can be seen as early as 12-24 hours after injection. Altogen’s transfection reagents enable efficient delivery of functional DNA and RNA molecules in vivo. The PEG-Liposome delivery system reduces innate immune responses due to PEG modification, and provides highly efficient and targeted in vivo tissue delivery. Altogen Biosystems is a life sciences company dedicated to the development, marketing and manufacture of cell type specific transfection reagents. Efficient delivery of DNA, RNA, and siRNA enabled by advanced formulation of reagents and peculiar design of protocols. Altogen Biosystems offers a complete transfection system for a broad range of cell lines. All reagents are functionally tested to be highly reproducible, serum compatible, induce low toxicity, and can be used for co-transfection experiments, and high throughput applications. The advanced services provided by Altogen Biosystems include contract research work and preclinical studies. This outsourcing is done to receive fast, efficient results from Altogen Biosystems. Whether it be part of a regulatory process or done to secure a patent, Altogen is an advanced laboratory that delivers products at superior promptness. This cell and molecular lab specializes in top tier transfection technology fortified by years of research, expertise, and high-end lab machinery. Altogen Labs provides specialized biotechnology and pharmaceutical services, including generation of stable cell lines, RNA interference (RNAi) services, pharmacology and toxicology testing: over 60 validated xenograft models (NOD/SCID), assay development (RT-PCR, automated Western Blot, ELISA), IC-50, siRNA library screening and transfection services, liposome encapsulation, cell banking/cryopreservation, and many more biology contract research (CRO) and preclinical research services.